Move potential buyers along the purchase loop from research to shopping actions. Search Optics creates greater awareness, reach, and frequency for your brand through highly effective, promotion-oriented, and consistent messaging, which our staff of professionals continually monitor and optimise. We spend strategically on advertising by purchasing impressions in real time. Our programmatic display solution balances the best of both worlds – the eye-catching appeal of bold imagery and multiple targeting options – to meet in-market customers at the right time with the right ad. We partner with the best data providers to reinforce your brand messaging at every step in the purchase process. Our industry-leading staff of the most Google-certified professionals not only spark your customers' interest, but also save you money by using the latest media buying technologies. Most certified staff – We have the most Google-certified in the industry actively managing and optimising your campaigns. Remarketing – By remarketing to existing visitors to your site, we drive down the cost of reaching new customers. VIN-level remarketing – We remarket to visitors to specific VDPs by showing them the actual vehicle researched in dynamic banner ads. Behavioral targeting – Our team of experts target potential customers using a wide variety of behavioral cues. Video – Search Optics uses pre-roll streaming video to advertise to in-market audiences and improve brand recall. Manage your social media spend to gain the upper hand in driving user engagement. A well-managed social media program doesn’t simply accrue followers or collect “likes.” Our integrated approach does more, in more ways: from managing your reputation and creating compelling content to optimising local listings and promoting posts on major networks. Search Optics focuses on engagements that drive brand loyalty, which can lead to repeat sales, as one-time buyers become loyal clients or even advocates for your business, thus extending your reach to new consumers and generating recurring ROI. 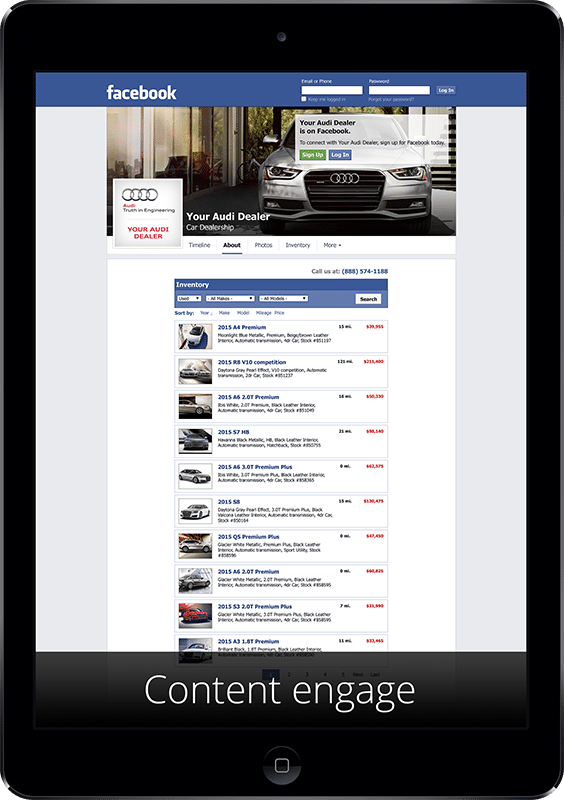 Content acceleration – We direct customers to your content and engage shoppers who are researching vehicle options. Free social media management – Search Optics manages your online community as a standard part of our packages. Behavioral targeting – Our experts target potential customers using a wide variety of behavioral cues. Video – Search Optics promotes video with targeted content messages that increase awareness and improve your ROI. Interested in building brand awareness? Let us supply you with the solutions to better demand generation.